Everyone knows by now that Sensei Steven Seagal (pictured) taught (or at least took credit for teaching) former UFC middleweight champion Anderson Silva the front kick to the face that knocked out Vitor Befort at UFC 126, as well as Lyoto Machida’s face-kick on Randy Couture at UFC 129, but Seagal has been relatively quite on the MMA scene since those infamous strikes. Well, guess who’s back just in the nick of time for one of the most anticipated light heavyweight fights in UFC history?! There were reports earlier this week that Seagal would be flying to Vegas to give Daniel Cormier some last-minute tricks before he faces Jon Jones tonight at UFC 182, and the magic happened on New Year’s Day at The Ultimate Fighter gym. Seagal said Cormier asked him to “show him a couple things that are unusual,” and Seagal was more than happy to oblige. The good news, the UFC’s “Embedded” crew was there to capture the footage. The bad news, Seagal made them turn off their cameras when Seagal 101 was in session. “I mean, you know very well what could happen if he does one of those right,” Seagal said with a chuckle after working with Cormier. “If he does one of those right, the game is over, the fight is over. You know that. Imagine if Cormier uses one of Seagal’s secret moves to finish Jones tonight. 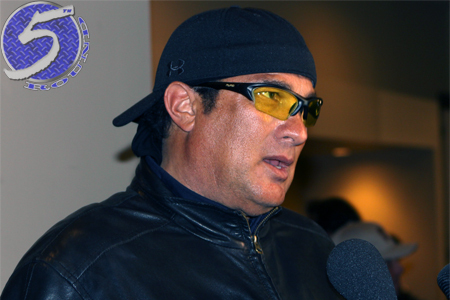 How many MMA fans will be eating crow courtesy of Seagal?